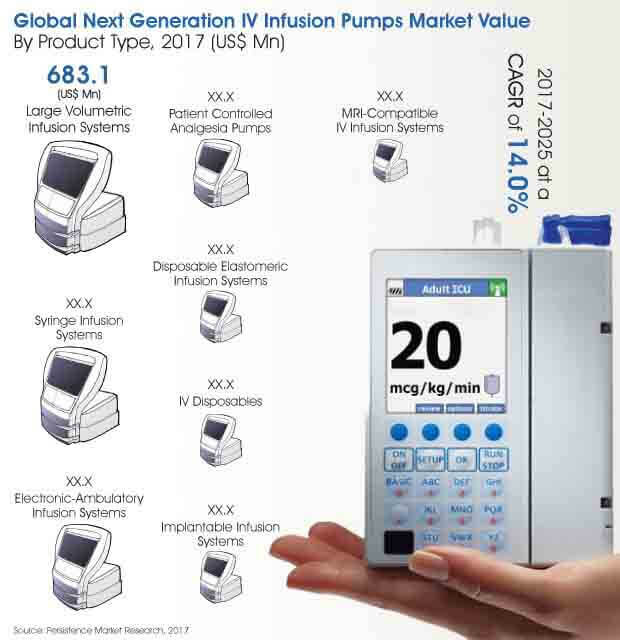 A recent market research study on next-generation IV infusion pumps has been carried out by Persistence Market Research and the facts and figures have been included in its new detailed research publication titled “Next-generation IV Infusion Pumps Market: Global Industry Analysis (2012-2016) and Forecast (2017-2025)”. The market research report on next-generation IV infusion pumps market uncovers all the angles of the market across all important regions. A global market representation is portrayed which will enable the reader to get a detailed preview of the market based on which new strategies can be devised and implemented basis the target audience. This report gives an in depth analysis on the various factors present in the global market which have an influence over the market growth. Various opportunities and trends are also sketched which will decide the future prospects in the market along with drivers which directly impact the market growth. Based on the market restraints, it would be possible to chalk out the essential detours in order to avoid loopholes in the market and establish a proper growth path for the years to come. The research study thus unmasks a holistic angle from a global standpoint. A unique research process is followed at Persistence Market Research which is used to draw conclusions with the help of accurate statistical representations. Initial phase of this research methodology involves massive secondary research which gives a direction to carry out further research based on the well-defined market definition. After obtaining sufficient market understanding, a primary research is carried out in which key players, domain experts and market observers are interviewed. Gathering data from the key opinion leaders and market observers with the help of primary intelligence can improve accuracy as this data is cross verified at every stage of the primary research which increases the chances of reducing deviations and variations in the statistical analyses thus improving the research accuracy to a greater extent. Decisions are dependent upon situations, which can change due to any factor in the market. One such factor is competition. A separate section on competitive dashboard is available in the next-generation IV infusion pumps market research report which discusses the key market players and overall competitive landscape. Information on the various products and services (product portfolio), distribution channels, expansion in various geographies, growth strategies, marketing plans and promotion tactics, mergers and acquisitions taking place or taken place in the recent past, etc., are few the many important aspects revolving around the key players present in the global next-generation IV infusion pumps market. The global next-generation IV infusion pumps market research report delivers valuable insights and the credibility of the research report lies in this actionable intelligence that it provides, which can be used to establish a global footprint. Just a click away, the user can avail information on any segment, any region and any technology. Real time analysis has increased the weightage of the research giving an all-inclusive angle to the market study which assists the viewers in chalking important corporate strategies pertaining to price, place and promotion along with regional forecasts. A comprehensive research report on global next-generation IV infusion pumps crafted by Persistence Market Research stresses on the fact that the global next-generation IV infusion pumps market is expected to witness noteworthy growth during the 2017-2025 assessment period. According to the report, the global next-generation IV infusion pumps market was valued at about US$ 2 Bn in 2016, and the market evaluation witnessed an upward graph to reach a value of around US$ 3.2 Bn in 2025. The global next-generation IV infusion pumps market is poised to show robust growth to move at a 5.4% CAGR throughout the period of assessment 2017-2025. Large volumetric infusion systems segment by product type is anticipated to witness a significant growth rate during the forecast period 2017-2025, to reflect a CAGR of 6.2%. With this growth rate and based on earlier market estimations of this segment, it is estimated to be valued at about US$ 1.1 Bn by 2025, leading the global next-generation IV infusion pumps market by product type with respect to high market value. The large volumetric infusion systems segment lead the global market since 2012, and can be said that this segment is reaching its maturity phase of the PLC. Electronic-ambulatory infusion systems segment by product type is poised to witness robust growth rate during the assessment period. It is projected to grow at a 7.0% CAGR to reach a market valuation to take second position after large volumetric infusion systems. This segment has high growth rate as well as significant market value, thus can be inferred to as an opportunity thrower with high potential in the coming years. The fastest growing segment among product type segments is the MRI-compatible infusion systems, which is growing at a high value CAGR of 8.3% during the assessment period. However, the segment reflected a low market valuation in 2016, and is estimated to reach US$ 58.3 Mn by 2025. By geography, the Asia Pacific region is anticipated to grow at a highest growth rate during the assessment period. This region is filled with opportunities to several players involved in the next-generation IV infusion pumps market. Comparatively lower set up costs and availability of cheap labor are two important factors which lure several medical device players in the APAC region. This region is more favorable for large volumetric infusion systems segment by product type. This segment is projected to grow at a high CAGR of 10.4% throughout the period of assessment. By volume and value, this segment has lead the Asia Pacific next-generation IV infusion pumps market in 2016 and by 2025 it is anticipated to maintain its status quo to reflect a high value of about US$ 233 Mn. North America region is expected to dominate the global next-generation IV infusion pumps market with respect to market value throughout the 2017-2025 assessment period. The large volumetric infusion systems segment has witnessed high market share of about US$ 380 Mn, but comparatively less growth than APAC. MRI-compatible infusion systems segment by product type is expected to grow at a high CAGR in North America. On the other hand, electronic-ambulatory infusion systems segment is projected to grow at higher CAGR in Europe followed by disposable elastomeric infusion systems.